Criticism of Scotland boss Alex McLeish has been "irrational", says Aberdeen manager Derek McInnes. McLeish has come under fire after the Scots' underwhelming start to their Euro 2020 qualifying campaign. Scotland have secured a Nations League play-off but lost 3-0 in Kazakhstan before a 2-0 win over San Marino, the world's lowest-ranked team, in their opening group matches this month. 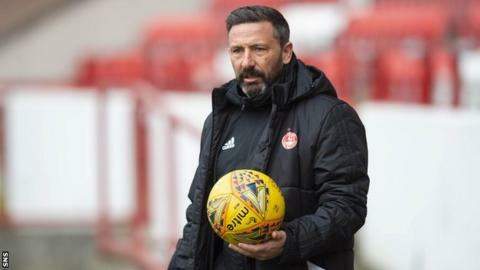 "Some of the criticism has been over the top," McInnes said. "Alex was put in the job to get the country to a major tournament. He's still in a position he can do that. "Alex is a good man and I think a lot of the fall-out from this has been a bit irrational, as it normally is. But he is the manager of country and it is up to us all to try and support him in that." How does Alex McLeish stack up after first year in charge? In November, McLeish's men topped a Nations League pool that also included Albania and Israel, guaranteeing Scotland an additional opportunity to make the 2020 finals should they fail to progress from their qualifying group. McInnes believes that while Scotland have flaws, they are capable of ending their 22-year wait for a finals appearance in this campaign. "It wasn't so long ago after the Israel game that we were all excited about this young looking energetic side," he added. "For me there's still the nucleus there of a good squad that can get the job done. "We're not perfect clearly but I do believe as a country we can get the sequence of results to get us to a major tournament."